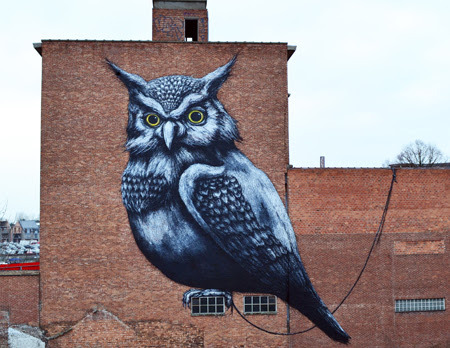 Belgium artist ROA is renowned for his unique portrayal of large scale urban wildlife, disquietly cohabiting city streets, hand painted in his distinctive black and white style. ROA has become famous from painting animals on derelict buildings, shutters & walls literally all over the world. He has also exhibited to much acclaim all over the world and was also included in the MOCA exhibition 'Art In The Streets' in LA. For his upcoming show 'Hypnagogia' at Stolen Space the artist will be showing work in 2 spaces, one featuring installation work & the other originals on found objects. To coincide with this show opening will also be the launch of ROA's first artist book 'Roa: 'An Introduction To Animal Representation' by Mammal Press. The book will be priced at £175, will be sold from the StolenSpace permanent gallery only (not Osborne St), 1 per person and only 75 of the 500 will be available on the night.